Bulky coats should not be worn under the straps of a car seat, according to Car Seats Colorado. Car crashes are a leading cause of death among children younger than age of 13, nationwide, and, according to the National Highway Traffic Safety Administration, three out of four children are not properly restrained when riding in vehicles. Factors contributing to improperly restrained children include an improperly installed car seat, use of a car seat that does not fit the child and failure to properly secure the harness or seat belt. With snow and colder temperatures expected in many parts of Colorado during the weekend, Car Seats Colorado — which includes the Colorado State Patrol, CDOT, local car seat technicians, law enforcement, emergency services and other professionals who are dedicated to implementing child passenger safety programs — reminds parents and caregivers that bulky winter coats pose a danger to children riding in car seats and should not be worn underneath the harness. While it may seem counterintuitive, strapping a child who is wearing a puffy winter jacket into a car seat an actually be very dangerous. During a crash, the material of the coat compresses, leaving the harness straps too loose to be effective. Car Seats Colorado offers the following tips to determine if a child’s coat is too bulky for use with a car seat. o Put the coat on the child and strap him or her into the car seat. Use the “pinch test” to ensure the harness is tight enough. Tighten the harness until no excess strap can be pinched between the thumb and forefinger. o Without loosening the harness, remove the child from the car seat. o Take the coat off, put the child back in the car seat and buckle the harness. o Try the pinch test again — if excess fabric can be pinched on the shoulder strap, the coat is too bulky to be worn under the harness. Following are alternatives to using a bulky coat in conjunction with a car seat. o For infants and smaller children, put a blanket over the child in the car seat to keep him or her warm. Do not cover the entire car seat with the blanket, as this can restrict airflow and may lead to carbon dioxide poisoning. o For toddlers and older children, put a blanket over the child after he or she has been strapped into the harness, or turn the jacket around, and put the child’s arms through it backward. o Be careful not to overheat the child — a baby bundled up with blankets in the car while the heat is blasting can quickly overheat. 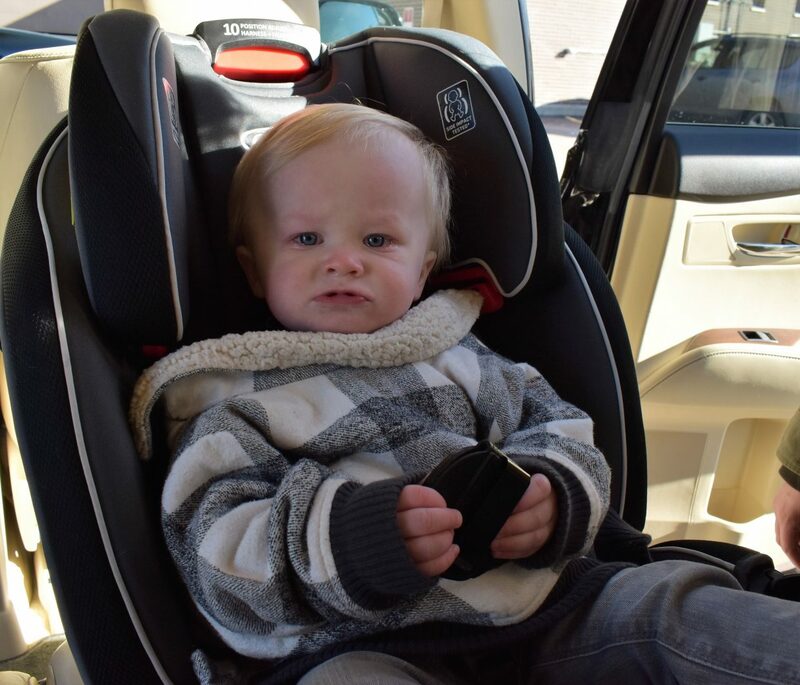 To car seats inspected for proper installation, visit one of Car Seats Colorado’s inspection stations, located throughout the state. To learn more about how to keep children safe in vehicles, download informational resources and find a nearby car seat inspection station, visit carseatscolorado.com.